Each category of Boris Continuum Complete filters is now available as a separate Boris Continuum Unit, allowing you to choose toolsets that are geared towards your specific needs. • Art Looks ($199). Simulate pencil-sketched images, the wash look of a watercolor painting, a rotoscope toon-animation look, charcoal drawings, and more. • Blur and Sharpen ($199). Emulate a rack defocus effect, create in-camera motion blur effects, and achieve stylized depth-of-field looks. • Color and Tone ($299). Independently adjust the bright, mid, and dark regions of an image clip, make adjustments to a specific color in a scene, and much more. • Film Style ($299). Generate the warm organic look of film in seconds with customizable film glow, film grain, and film process looks. • Image Restoration ($299). Reduce noise, remove flicker, upscale SD to HD, repair bad pixels, smooth and soften skin imperfections, and remove unwanted foreground objects. 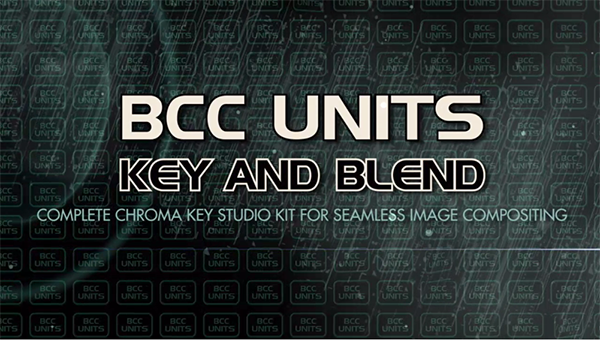 • Key and Blend ($299). An award-winning suite of chroma key tools complete with spill suppression, matte choker, and light wrap. • Lights ($299). Produce stunning volumetric lighting effects and real-world lens flares. • Match Move ($199). Achieve fast and easy witness protection and billboard sign replacement effects. • Particles ($299). BCC particle effects give 3D broadcast designers the ultimate particle machine, providing powerful, flexible, and OpenGL-accelerated options. Create realistic explosions, rain, snow, and other organic matter with full 3D camera and lighting control. • Perspective ($199). Create smooth, professional Ken Burns-style animations, shatter video into 3D shards, and generate 3D shapes with image mapping. • Stylize ($199). Popular stylized VFX include LED, Damaged TV, Tile Mosaic, Prism, Scanline, Colorize Glow, and Emboss. • Textures ($199). Generate realistic textures such as Steel Plates, Clouds, Wooden Planks, and Rock. The procedurally-generated textures render smoothly at any scale. • Time ($199). Smoothly retime clips and easily achieve a variety of temporal effects. • Transitions ($199). Choose from a variety of wipes, transition effects, and presets and easily customize the effects using an on-screen, graph-curve user interface. • Warp ($199). Create animated morphs, bulges, ripples, and waves. Continuum Unit purchases can be credited towards a full Continuum Complete license purchase at any time.